Rencana ini sedang aktif menjalani terjemahan daripada Wikipedia lain untuk sementara. Anda diminta untuk tidak menyunting rencana ini apabila templat ini dipaparkan. Anda boleh menghubungi orang yang menambah notis ini melalui sejarah suntingan. Dalam bola sepak, begitu juga sukan-sukan lain, "kit" merujuk kepada peralatan yg menepati piawai dan pakaian yang dipakai oleh pemain. Terma "kit", "jalur", dan di Amerika-Utara Inggeris "Seragam" digunakan silih-berganti. Peraturan perlawanan menyatakan bilangan minimum kit yang perlu pemain gunapakai, dan juga melarang menggunakan apa-apa yang berbahaya kepada sama ada pemain ataupun yang turut terlibat. Pertandingan secara individu mungkin menetapkan sekatan lanjutan, seperti mengawal-selia saiz logo yang dipamerkan diatas baju, dan didalam acara antara pasukan yang mempunyai warna yang serupa, pasukan pihak pelawat perlu menukar kepada warna berlainan. Kebiasaanya, pemain bola sepak dikenalpasti dengan memakai nombor dibelakang baju mereka. Pada asalnya pemain satu pasukan akan memakai nombor dari 1 hingga 11, sepadan dengan posisi mereka secara khususnyan, tetapi di tahap profesional ianya telah diganti dengan penomboran pasukan umumnya, dimana setiap pemain dalam satu pasukan akan diberi nombor tetap untuk jangkamasa satu musim. Kelab profesional juga kebiasaanya memaparkan nama pemain ataupun nama samaran dibelakang baju, diatas (atau, jarang-jarang, dibawah) nombor pasukan. Kit bola sepak telah berkembang dengan ketara sejak dari awal lagi sukan dipermainkan dimana biasanya pemain memakai baju kapas tebas, knickerbockers and kasut bola kulit yang berat. Pada abad 20-an, kasut bola menjadi ringan dan lembut, seluar pendek dipakai lebih pendek, dan kemajuan dalam pembuatan pakaian dan cetakan membernarkan baju dicipta dengan lebih ringan mengunakna serat sintetik yang semakin berwarna-warni beserta rekabentuk kompleks. Peningkatan pengiklanan di abad 20-an, Logo penaja sudah mula diletakkan diatas baju, dan baju replika dibuat khas untuk peminat, menjana sejumlah pendapatan buat pasukan atau kelab. Shin pads perlu dipakai mengikut peratuan. The Laws of the Game set out the basic equipment which must be worn by all players in Law 4: The Players' Equipment. Five separate items are specified: shirt (also known as a jersey), shorts, socks (also known as stockings), footwear and shin pads. Goalkeepers are allowed to wear tracksuit bottoms instead of shorts. While most players wear studded football boots ("soccer shoes" or "cleats" in U.S. English), the Laws do not specify that these are required. Shirts must have sleeves (both short and long sleeves are accepted), and goalkeepers must wear shirts which are easily distinguishable from all other players and the match officials. Thermal undershorts may be worn, but must be the same colour as the shorts themselves. Shin pads must be covered entirely by the stockings, be made of rubber, plastic or a similar material, and "provide a reasonable degree of protection". The only other restriction on equipment defined in the Laws of the Game is the requirement that a player "must not use equipment or wear anything that is dangerous to himself or another player". It is normal for individual competitions to specify that all outfield players on a team must wear the same colours, though the Law states only "The two teams must wear colours that distinguish them from each other and also the referee and the assistant referees". In the event of a match between teams who would normally wear identical or similar colours the away team must change to a different colour. Because of this requirement a team's second-choice is often referred to as its "away kit" or "away colours", although it is not unknown, especially at international level, for teams to opt to wear their away colours even when not required to by a clash of colours, or to wear them at home. The England national team sometimes plays in red shirts even when it is not required, as this was the strip worn when the team won the 1966 FIFA World Cup. 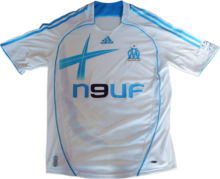 Many professional clubs also have a "third kit", ostensibly to be used if both their first-choice and away colours are deemed too similar to those of an opponent. Most professional clubs have retained the same basic colour scheme for several decades, and the colours themselves form an integral part of a club's culture. Teams representing countries in international competition generally wear national colours in common with other sporting teams of the same nation. These are usually based on the colours of the country's national flag, although there are exceptions—the Italian national team, for example, wear blue as it was the colour of the House of Savoy, the Australian team like most Australian sporting teams wear the Australian National Colours of green and gold, neither of which appear on the flag, and the Dutch national team wear orange, the colour of the Dutch Royal House. Shirts are normally made of a polyester mesh, which does not trap the sweat and body heat in the same way as a shirt made of a natural fibre. Most professional clubs have sponsors' logos on the front of their shirts, which can generate significant levels of income, and some also offer sponsors the chance to place their logos on the back of their shirts. Depending on local rules, there may be restrictions on how large these logos may be or on what logos may be displayed. Competitions such as the Premier League may also require players to wear patches on their sleeves depicting the logo of the competition. A player's number is usually printed on the back of the shirt, although international teams often also place numbers on the front, and professional teams generally print a player's surname above his number. The captain of each team is usually required to wear an elasticated armband around the left sleeve to identify him as the captain to the referee and supporters. 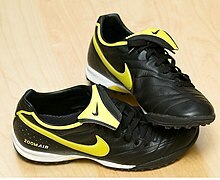 Most current players wear specialist football boots, which can be made either of leather or a synthetic material. Modern boots are cut slightly below the ankles, as opposed to the high-ankled boots used in former times, and have studs attached to the soles. Studs may be either moulded directly to the sole or be detachable, normally by means of a screw thread. Modern boots such as the Adidas Predator, originally designed by former Liverpool player Craig Johnston, feature increasingly intricate, scientifically aided designs and features such as air pockets in the soles and rubber "blades" on the sole rather than studs. The blades have been the subject of controversy as several top managers have blamed them for injuries both to opposition players and to the wearers themselves. The Laws of the Game specify that all players, regardless of gender, must wear the same kit, however in September 2008 the Dutch women's team FC de Rakt made international headlines by swapping its old strip for a new one featuring short skirts and tight-fitting shirts. This innovation, which had been requested by the team itself, was initially vetoed by the KNVB, Dutch football's governing body, but this decision was reversed when it was revealed that the FC de Rakt team were wearing hot pants under their skirts, and were therefore technically in compliance. 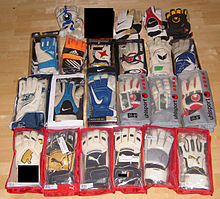 All players are permitted to wear gloves, and goalkeepers usually wear specialist goalkeeping gloves. Prior to the 1970s, gloves were rarely worn, but it is now extremely unusual to see a goalkeeper without gloves. In Portugal's match against England in the Euro 2004 tournament, Ricardo drew much comment for deciding to remove his gloves during the penalty shoot-out. Since the 1980s significant advancements have been made in the design of gloves, which now feature protectors to prevent the fingers bending backwards, segmentation to allow greater flexibility, and palms made of materials designed to protect the hand and to enhance a player's grip. Gloves are available in a variety of different cuts, including "flat palm", "roll finger" and "negative", with variations in the stitching and fit. Goalkeepers sometimes also wear caps to prevent glare from the sun or floodlights affecting their performance. Players with sight problems may wear glasses as long as there is no risk of them falling off or breaking and thereby becoming dangerous. Most players affected choose to wear contact lenses, although Dutch player Edgar Davids, who is unable to wear contact lenses due to his glaucoma, is known for his distinctive wraparound goggles. Other items that may be dangerous to other players, such as jewellery, however, are not allowed. Players may also choose to wear headgear to protect themselves from head injury as long as it presents no risk to the safety of the wearer or any other player. Referees, assistant referees and fourth officials wear kits of a similar style to that worn by players; until the 1950s it was more common for a referee to wear a blazer than a jersey. 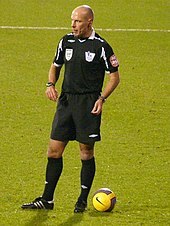 Although not specified in the Laws of the Game, it is considered a principle of football that officials wear shirts of a different colour to those worn by the two teams. In 1998 Premier League referee David Elleray was forced to change his shirt midway through a match between Aston Villa and Wimbledon as it was deemed too similar to that worn by the Wimbledon players. Black is the traditional colour worn by officials, and "the man in black" is widely used as an informal term for a referee, although increasingly other colours are being used in the modern era. The 1994 World Cup was the first in which FIFA allowed officials to wear colours other than black. Referees also sometimes have sponsors' logos on their shirts, although these are normally confined to the sleeves. The first written evidence of a clothing item specifically dedicated to football comes in 1526 from the Great Wardrobe of King Henry VIII of England, which included a reference to a pair of football boots. The earliest evidence of coloured shirts used to identify football teams comes from early English public school football games, for example an image of Winchester College football from before 1840 is entitled "The commoners have red and the college boys blue jerseys" and such colours are mentioned again in a Bell's Life in London article of 1858. House sporting colours are mentioned in Rugby football (rule XXI) as early as 1845: "No player may wear cap or jersey without leave from the head of his house". In 1848 it was noted at Rugby that "considerable improvement has taken place in the last few years, in the appearance of a match... in the use of peculiar dress consisting of velvet caps and jerseys"
Organised association football was first played in England in the 1860s, and many teams would probably play in whatever clothing they had available, with players of the same team distinguishing themselves by wearing coloured caps or sashes. This came to be problematic though, and an 1867 handbook of the game suggested that teams should attempt "if it can be previously so arranged, to have one side with striped jerseys of one colour, say red, and the other with another, say blue. This prevents confusion and wild attempts to wrest the ball from your neighbour." The New Brompton team of 1894 sporting typical kit of the era, including heavy jersey, long shorts, heavy high-topped boots and shin pads worn outside the stockings. The first standard strips began to emerge in the 1870s, with many clubs opting for colours associated with the schools or other sporting organisations from which the clubs had emerged. Blackburn Rovers, for example, adopted shirts of a halved design based on those of the team for former pupils of Malvern College, one of the schools where the sport had developed. Their original colours of light blue and white were chosen to reflect an association with Cambridge University, where a number of the club's founders had been educated. Colours and designs often changed dramatically between matches, with Bolton Wanderers turning out in both pink shirts and white shirts with red spots within the same year. Rather than the modern shorts, players wore long knickerbockers or full-length trousers, often with a belt or even braces. Lord Kinnaird, an early star of the game, was noted for always being resplendent in long white trousers. There were no numbers printed on shirts to identify individual players, and the programme for an 1875 match between Queen's Park and Wanderers in Glasgow identifies the players by the colours of their caps or stockings. The first shin pads were worn in 1874 by the Nottingham Forest player Sam Weller Widdowson, who cut down a pair of cricket pads and wore them outside his stockings. Initially the concept was ridiculed but it soon caught on with other players. By the turn of the century pads had become smaller and were being worn inside the stockings. As the game gradually moved away from being a pursuit for wealthy amateurs to one dominated by working-class professionals, kits changed accordingly. The clubs themselves, rather than individual players, were now responsible for purchasing kit and financial concerns, along with the need for the growing numbers of spectators to easily identify the players, led to the lurid colours of earlier years being abandoned in favour of simple combinations of primary colours. In 1890 the Football League, which had been formed two years earlier, ruled that no two member teams could register similar colours, so as to avoid clashes. This rule was later abandoned in favour of one stipulating that all teams must have a second set of shirts in a different colour available. Initially the home team was required to change colours in the event of a clash, but in 1921 the rule was amended to require the away team to change. Specialised football boots began to emerge in the professional era, taking the place of everyday shoes or work boots. Players initially simply nailed strips of leather to their boots to enhance their grip, leading the Football Association to rule in 1863 that no nails could project from boots. By the 1880s these crude attachments had become studs. Boots of this era were made of heavy leather, had hard toecaps, and came high above a player's ankles. As the game began to spread to Europe and beyond, clubs adopted kits similar to those worn in the United Kingdom, and in some cases chose colours directly inspired by British clubs. In 1903, Juventus of Italy adopted a black and white strip inspired by Notts County. Two years later, Argentina's Club Atlético Independiente adopted red shirts after watching Nottingham Forest play. 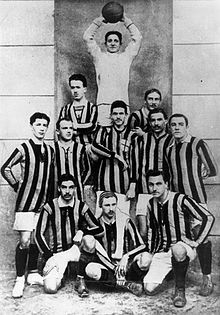 By the early 20th century shorts had become shorter and goalkeepers wore shirts of a different colour, as seen in this photograph of Internazionale in 1910. In 1904 the Football Association dropped its rule that players' knickerbockers must cover their knees and teams began wearing them much shorter. They became known as "knickers", and were referred to by this term until the 1960s when "shorts" became the preferred term. Initially, almost all teams wore knickers of a contrasting colour to their shirts. In 1909, in a bid to assist referees in identifying the goalkeeper amongst a ruck of players, the Laws of the Game were amended to state that the goalkeeper must wear a shirt of a different colour to his team-mates. Initially it was specified that goalkeepers' shirts must be either scarlet or royal blue, but when green was added as a third option in 1912 it caught on the extent that soon almost every goalkeeper was playing in green. In this period goalkeepers generally wore a heavy woollen garment more akin to a jumper than the shirts worn by outfield players. Sporadic experiments with numbered shirts took place in the 1920s but the idea did not initially catch on. The first major match in which numbers were worn was the 1933 FA Cup Final between Everton and Manchester City. Rather than the numbers being added to the clubs' existing strips, two special sets, one white and one red, were made for the final and allocated to the two teams by the toss of a coin. The Everton players wore numbers 1–11, while the City players wore 12–22. It was not until around the time of the Second World War that numbering became standard, with teams wearing numbers 1–11. Although there were no regulations on which player should wear which number, specific numbers came to be associated with specific positions on the field of play, a prime example being the number 9 shirt which was usually reserved for the team's main striker. In contrast to the usual practice, Scottish club Celtic wore numbers on their shorts rather than their shirts until 1975 for international matches, and until 1994 for domestic matches. The 1930s also saw great advancements in boot manufacture, with new synthetic materials and softer leathers becoming available. By 1936 players in Europe were wearing boots which weighed only a third of the weight of the rigid boots of a decade earlier, although British clubs did not adopt the new-style boots, with players such as Billy Wright openly pronouncing their disdain for the new footwear and claiming that it was more suited to ballet than football. The national team of Argentina in typical kit of the early 1960s. In the period immediately after the war, many teams in Europe were forced to wear unusual kits due to clothing restrictions. England's Oldham Athletic, who had traditionally worn blue and white, spent two seasons playing in red and white shirts borrowed from a local rugby league club, and Scotland's Clyde wore khaki. In the 1950s kits worn by players in southern Europe and South America became much more lightweight, with V-necks replacing collars on shirts and synthetic fabrics replacing heavy natural fibres. The first boots to be cut below the ankle rather than high-topped were introduced by Adidas in 1954. Although they cost twice as much as existing styles the boots were a huge success and cemented the German company's place in the football market. Around the same time Adidas also developed the first boots with screw-in studs which could be changed according to pitch conditions. Other areas were slower to adopt the new styles – British clubs once again resisted change and stuck resolutely to kits little different to those worn before the war, and Eastern European teams continued to wear kits that were deemed old-fashioned elsewhere. The FC Dynamo Moscow team that toured Western Europe in 1945 drew almost as much comment for the players' long baggy shorts as for the quality of their football. With the advent of international competitions such as the European Cup, the southern European style spread to the rest of the continent and by the end of the decade the heavy shirts and boots of the pre-war years had fallen entirely out of use. The 1960s saw little innovation in kit design, with clubs generally opting for simple colour schemes which looked good under the newly adopted floodlights. Designs from the late 1960s and early 1970s are highly regarded by football fans. 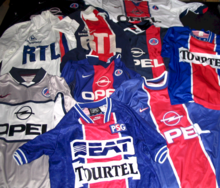 Sponsored shirts, such as these worn in various seasons by Paris St Germain, became the norm in the modern era. In the 1970s clubs began to create strongly individual strips, and in 1975 Leeds United, who had changed their traditional blue and gold colours to all white in the 1960s to mimic Real Madrid, became the first club to design shirts which could be sold to fans in the form of replicas. Driven by commercial concerns, other clubs soon followed suit, adding manufacturers' logos and a higher level of trim. In 1973, German team Eintracht Braunschweig signed a deal with local alcohol producer Jägermeister to display its logo on the front of their shirts. Soon almost all major clubs had signed such deals, and the cost to companies who sponsor large teams has increased dramatically. In 2008 German club FC Bayern Munich received €25 million in sponsorship money from Deutsche Telekom. However Spanish clubs FC Barcelona and Athletic Bilbao refused to allow sponsors' logos to appear on their shirts as recently as 2005. Until 2011 Barcelona refused paying sponsors in favour of wearing the UNICEF logo on their shirts while donating €1.5 million to the charity per year. Players also began to sign sponsorship deals with individual companies. In 1974 Johan Cruijff refused to wear the Dutch national team's strip as its Adidas branding conflicted with his own individual contract with Puma, and was permitted to wear a version without the Adidas branding. Puma had also paid Pelé $120,000 to wear their boots and specifically requested that he bend down and tie his laces at the start of the 1970 FIFA World Cup final, ensuring a close-up of the boots for a worldwide television audience. In the 1980s manufacturers such as Hummel and Adidas began to design shirts with increasingly intricate designs, as new technology led to the introduction of such design elements as shadow prints and pinstripes. Hummel's distinctive halved strip designed for the Danish national team for the 1986 FIFA World Cup caused a stir in the media but FIFA worried about moiré artefacts in television pictures. Shorts became shorter than ever during the 1970s and 80s, and often included the player's number on the front. In the 1991 FA Cup Final Tottenham Hotspur's players lined up in long baggy shorts. At the time the new look was derided, but within a short period of time clubs both in Britain and elsewhere had adopted the longer shorts. In the 1990s shirt designs became increasingly complex, with many teams sporting extremely gaudy colour schemes. Design decisions were increasingly driven by the need for the shirt to look good when worn by fans as a fashion item, but many designs from this era have since come to be regarded as amongst the worst of all time. In 1996, Manchester United notoriously introduced a grey strip which had been specifically designed to look good when worn with jeans, but abandoned it halfway through a match after manager Alex Ferguson claimed that the reason why his team was losing 3–0 was that the players could not see each other on the pitch. United switched to different colours for the second half and scored one goal without reply. The leading leagues also introduced squad numbers, whereby each player is allocated a specific number for the duration of a season. A brief fad arose for players celebrating goals by lifting or completely removing their shirts to reveal political, religious or personal slogans printed on undershirts. This led to a ruling from the International Football Association Board in 2002 that undershirts must not contain slogans or logos; since 2004 it has been a bookable offence for players to remove their shirts. 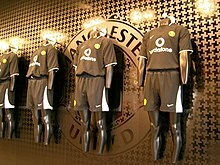 Manchester United replica strips on display. The market for replica shirts has grown enormously, with the revenue generated for leading clubs and the frequency with which they change designs coming under increased scrutiny, especially in the United Kingdom, where the market for replicas is worth in excess of £200m. Several clubs have been accused of price fixing, and in 2003 Manchester United were fined £1.65m by the Office of Fair Trading. The high prices charged for replicas have also led to many fans buying fake shirts which are imported from countries such as Thailand and Malaysia. Nonetheless, the chance for fans to purchase a shirt bearing the name and number of a star player can lead to significant revenue for a club. In the first six months after David Beckham's transfer to Real Madrid the club sold more than one million shirts bearing his name. 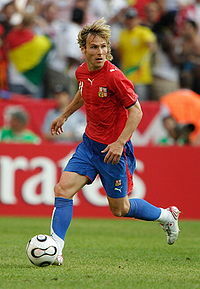 A market has also developed for shirts worn by players during significant matches, which are sold as collector's items. The shirt worn by Pelé in the 1970 FIFA World Cup Final sold at auction for over £150,000 in 2002. A number of advances in kit design have taken place since 2000, with varying degrees of success. In 2002 the Cameroon national team competed in the African Cup of Nations in Mali wearing shirts with no sleeves, but FIFA later ruled that such garments were not considered to be shirts and therefore were not permitted under the Laws of the Game. Manufacturers Puma AG initially added "invisible" black sleeves to comply with the ruling, but later supplied the team with new one-piece singlet-style tops. FIFA ordered the team not to wear the tops but the ruling was disregarded, with the result that the Cameroon team was deducted six points in its qualifying campaign for the 2006 FIFA World Cup, a decision later reversed after an appeal. More successful were the skin-tight shirts designed for the Italian national team by manufacturers Kappa, a style subsequently emulated by other national teams and club sides. A brief fashion for "snood" scarves ended in 2011 when the IFAB banned them as potentially dangerous. A ban on wearing the hijab was introduced by the IFAB in 2007, but lifted in 2012 after pressure from Prince Ali of Jordan. In keeping with French views, the French Football Federation said it would maintain its ban. ^ a b c d e f "Law 4 – The Players' Equipment". Laws of the Game 2008/2009 (PDF). FIFA. m/s. 18–19. Dicapai 1 September 2008. ^ "soccer player". Visual Dictionary Online. Merriam-Webster. Dicapai 28 April 2009. ^ a b Crisfield, Deborah (1999). The complete idiot's guide to soccer. The Complete Idiot's Guide to... Alpha Books. m/s. 47. ISBN 0-02-862725-3. ^ "Standardised League Rules". Wessex Football League. Diarkibkan daripada asal pada 6 March 2008. Dicapai 16 January 2008. ^ a b c d e f g h i j k David Moor. "A Brief History of Football Kit Design in England and Scotland". HistoricalFootballKits.co.uk. Dicapai 14 January 2008. ^ "What's in a name? Part II". FIFA. 5 February 2000. Dicapai 1 September 2008. ^ "Football and health". BUPA. Diarkibkan daripada asal pada 16 February 2008. Dicapai 17 January 2008. ^ "Man Utd sign £56m AIG shirt deal". BBC. 6 April 2006. Dicapai 16 January 2008. ^ "Back-of-the-shirt Sponsors Draw". Notts County F.C. 30 December 2007. Dicapai 16 January 2008. ^ "Regulations Relating to Advertising on the Clothing of Players, Club Officials and match Officials" (PDF). The FA. Diarkibkan daripada asal (PDF) pada 10 April 2008. Dicapai 16 January 2008. ^ "The F.A. Premier League". Chris Kay International. Diarkibkan daripada asal pada 7 March 2008. Dicapai 22 January 2008. ^ "Q & A 2006". England Football Online. 22 November 2006. Diarkibkan daripada asal pada 26 January 2008. Dicapai 16 January 2008. ^ Davies, Hunter (2003). "Chapter 3. Equipment: Bring on the Balls". Boots, Balls and Haircuts: An Illustrated History of Football from Then to Now. Cassell Illustrated. m/s. 158. ISBN 1-84403-261-2. ^ Mike Adamson (13 January 2006). "Adidas Predator Absolute". The Guardian. UK. Dicapai 16 January 2008. ^ "Ferguson wants bladed boots ban". BBC. 24 September 2005. Dicapai 18 January 2008. ^ "Warnock is concerned over blades". BBC. 19 August 2005. Dicapai 18 January 2008. ^ "Dutch women ditch shorts to play soccer in skirts". Reuters. 15 September 2008. Dicapai 20 April 2009. ^ Craig Brown (25 June 2004). "Football: Euro 2004: Referee's error denies England victory". The Independent. UK. Diarkibkan daripada asal pada 6 March 2008. Dicapai 15 January 2008. ^ "Goalkeeper Glove Cut Guide". TheGloveBag.com. 28 March 2006. Diarkibkan daripada asal pada 23 July 2008. Dicapai 14 July 2008. ^ "Goggles are Davids' most glaring feature". Soccertimes.com. 7 March 2003. Dicapai 16 January 2008. ^ "Cech's rugby-style headgear passes the FA's safety test". The Independent. UK. 20 January 2007. Dicapai 16 April 2008. ^ Jon Culley (13 September 1998). "Football: Merson revels in the Villa high life". The Independent. UK. Diarkibkan daripada asal pada 6 March 2008. Dicapai 23 January 2008. ^ Phil Shaw (16 August 2001). "Dowd sees the light as the man in black". The Independent. UK. Diarkibkan daripada asal pada 6 March 2008. Dicapai 15 January 2008. ^ Alex Yannis (1 March 1994). "Soccer: The Name Game". The New York Times. Dicapai 29 April 2009. ^ Chaudhary, Vivek (18 February 2004). "Who's the fat bloke in the number eight shirt?". The Guardian. UK. Dicapai 28 April 2009. ^ Marples, Morris (1954). A History of Football. Secker and Warburgh. m/s. 84–85. ^ "Bell's Life in London and Sporting Chronicle". London, England. 14 November 1858. ^ "Football Rules" (PDF). rugbyfootballhistory.com. Diarkibkan daripada asal (PDF) pada 29 December 2006. Dicapai 28 April 2009. ^ "An Old Rugbaean" (1848). Recollections of Rugby. Hamilton and Adams. m/s. 131. ^ Davies, Hunter. "Chapter 3. Equipment: Bring on the Balls". Boots, Balls and Haircuts: An Illustrated History of Football from Then to Now. m/s. 48. ^ "1875–1884: The early years". Blackburn Rovers F.C. 2 July 2007. Dicapai 14 January 2008. ^ Davies, Hunter. "Chapter 3. Equipment: Bring on the Balls". Boots, Balls and Haircuts: An Illustrated History of Football. m/s. 48–49. ^ a b c Davies, Hunter. "Chapter 3. Equipment: Bring on the Balls". Boots, Balls and Haircuts: An Illustrated History of Football from Then to Now. m/s. 51. ^ Will Bennett (7 January 2005). "Second FA Cup could fetch record £300,000 at auction". The Daily Telegraph. UK. Dicapai 15 January 2008. ^ "Hucknall Cricketers". Ashfield District Council. Dicapai 15 January 2008. ^ Davies, Hunter. "Chapter 3. Equipment: Bring on the Balls". Boots, Balls and Haircuts: An Illustrated History of Football from Then to Now. m/s. 57. ^ Davies, Hunter. "Chapter 3. Equipment: Bring on the Balls". Boots, Balls and Haircuts: An Illustrated History of Football from Then to Now. m/s. 55–56. ^ "Black & White". Notts County F.C. 21 May 2007. Dicapai 15 January 2008. ^ (Sepanyol) "Década del '10". Club Atlético Independiente. Diarkibkan daripada asal pada 6 March 2008. Dicapai 15 January 2008. ^ a b c Davies, Hunter. "Chapter 12. Equipment". Boots, Balls and Haircuts: An Illustrated History of Football from Then to Now. m/s. 156. ^ "English FA Cup Finalists 1930–1939". HistoricalFootballKits.co.uk. Dicapai 15 January 2008. ^ "Celtic". HistoricalFootballKits.co.uk. Dicapai 5 September 2011. ^ Davies, Hunter. "Chapter 12. Equipment". Boots, Balls and Haircuts: An Illustrated History of Football from Then to Now. m/s. 154–155. ^ "Oldham Athletic". HistoricalKits.co.uk. Dicapai 17 January 2008. ^ "Clyde". HistoricalKits.co.uk. Dicapai 17 January 2008. ^ Bob Crampsey (16 October 2001). "An historic day in Glasgow". BBC. Dicapai 15 January 2008. It's only a slight exaggeration to say that the Dynamo side looked like they came from Mars – they wore very dark blue tops and extremely baggy shorts with a blue band round the bottom. ^ Nick Szczepanik (26 September 2007). "The top 50 football kits". The Times. UK. Dicapai 17 January 2008. ^ Ball, Phil (2003). Morbo: The Story of Spanish Football. WSC Books Ltd. m/s. 113. ISBN 0-9540134-6-8. Indeed, when Don Revie took over at Leeds in the early 1960s he changed their kit from blue and gold to all white, modelling his new charges on the Spanish giants. ^ Hesse-Lichtenberger, Uli (7 October 2008). "The struggle for shirt sponsorship". ESPN. Dicapai 28 April 2009. ^ "Bundesliga 2008/2009 – Clubs, Vermarkter, Sponsoren" (PDF). Stuttgarter Zeitung. 2008. Dicapai 10 May 2009. ^ "Barcelona eyes Beijing shirt deal". BBC. 6 May 2005. Dicapai 24 January 2008. ^ "Futbol Club Barcelona, UNICEF team up for children in global partnership". UNICEF. Dicapai 26 August 2008. ^ Bruce Caldow. "Don't mention the boot war". The Journal. Diarkibkan daripada asal pada 6 March 2008. Dicapai 24 January 2008. ^ Erik Kirschbaum (8 November 2005). "How Adidas and Puma were born". The Journal. Dicapai 24 January 2008. ^ "Milestones: 1986". hummel International. Diarkibkan daripada asal pada 21 November 2007. Dicapai 16 January 2008. ^ Isherwood, Glen (6 June 2005). "Admiral Mysteries". England Football Online. Dicapai 28 January 2008. ^ "English FA Cup Finalists 1990–1999". HistoricalFootballKits.co.uk. Dicapai 15 January 2008. ^ Tom Fordyce (29 April 2003). "The worst football kits of all time". BBC. Dicapai 14 January 2008. ^ a b c Dominic Raynor (12 July 2005). "10 of the worst...football kits". ESPN. Dicapai 15 January 2008. ^ Rob Smyth and Paolo Bandini (6 September 2006). "What's in a number?". The Guardian. UK. Dicapai 16 January 2008. ^ Stuart Roach (11 September 2002). "Henry gets the message". BBC. Dicapai 24 January 2008. ^ "Fifa limits substitutions". BBC. 28 February 2004. Dicapai 20 April 2009. ^ "Clubs rapped over kit sales". BBC. 6 August 1999. Dicapai 14 January 2008. The cost of replica kit – and the number of times new versions come on the market – has long been a bone of contention for football fans. ^ "Man Utd fined for price fixing". BBC. 1 August 2003. Dicapai 14 January 2008. ^ Darragh MacIntyre (3 March 2006). "The Fake Football Shirt Sting". BBC. Dicapai 14 January 2008. ^ "Beckham sells 250,000 Galaxy shirts before he gets to LA". Reuters UK. 12 July 2007. Dicapai 14 January 2008. ^ "Record price for Pele's shirt". BBC. 22 March 2002. Dicapai 17 January 2008. ^ "Indomitable fashions". BBC. 22 January 2002. Dicapai 14 January 2008. ^ "Fifa bans Cameroon shirts". BBC. 9 March 2002. Dicapai 15 January 2008. ^ "Cameroon docked six World Cup points for controversial kit". ABC News Australia. 17 April 2004. Dicapai 15 January 2008. ^ Osasu Obayiuwana (21 May 2004). "Fifa lifts Cameroon sanction". BBC. Dicapai 15 January 2008. ^ Press Association (4 February 2011). "Fears for snoods' future after Fifa raises safety concerns". The Guardian. London. Dicapai 6 July 2012. ^ Agencies (5 May 2011). "Snoods banned but Fifa to continue goalline technology testing". The Guardian. London. Dicapai 23 September 2011. ^ "Hijabs approved for soccer players by FIFA". CBC News. 5 July 2012. Dicapai 4 June 2013. ^ Associated Press (5 July 2012). "FIFA OKs Islamic hijab for women – ESPN". ESPN. Dicapai 6 July 2012. ^ Agence France-Presse (6 July 2012). "France soccer federation outlaws hijab, despite FIFA ruling". National Post. Dicapai 6 July 2012. Laman ini diubah buat kali terakhir pada 18:20, 10 April 2015.